Located in the center of the North Florida Business Diamond (Tallahassee, Valdosta, Jacksonville and Gainesville) near the crossroads of I-75 and I-10, Live Oak already is a hub for art, music and ecotourism. Along with its springs, trails and the Suwannee River, Live Oak is home to the Spirit of the Suwannee Music Park which hosts more than 600,000 guests annually, most of whom would be open to traveling via rail service. County history, making living “way down upon the Suwannee River” possible for generations, with a depot ready for use in one of the safest areas of the city, downtown. Investing in the Live Oak Station can be an investment in the future of our community. A renovated train station can inspire real estate growth, dining and entertainment development, tourism and local economic spending. Suwannee County is home to the historic Suwannee River and boasts of many natural springs, parks, hiking and biking trails. 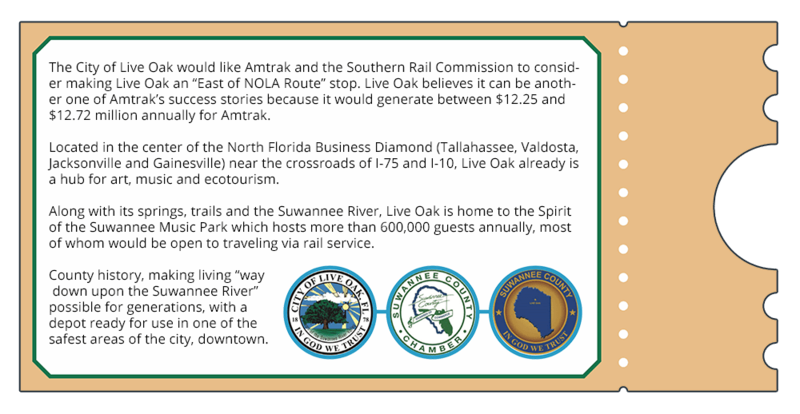 Live Oak, Fla. was once a railway hub; establishing a connection to that will support our community efforts to revitalize our destination heritage. Stations offer a return on investment for years to come. The placement of a stop here in Live Oak would be a huge financial boost not only to our lovely town, but, the entire Suwannee Valley Region. The inclusion of rail service in Live Oak will establish opportunities to build travel packages with Live Oak as a destination. We feel this will serve as a similar economic boost for downtown Live Oak and the surrounding businesses and real estate development, creating hundreds of jobs and opportunities. 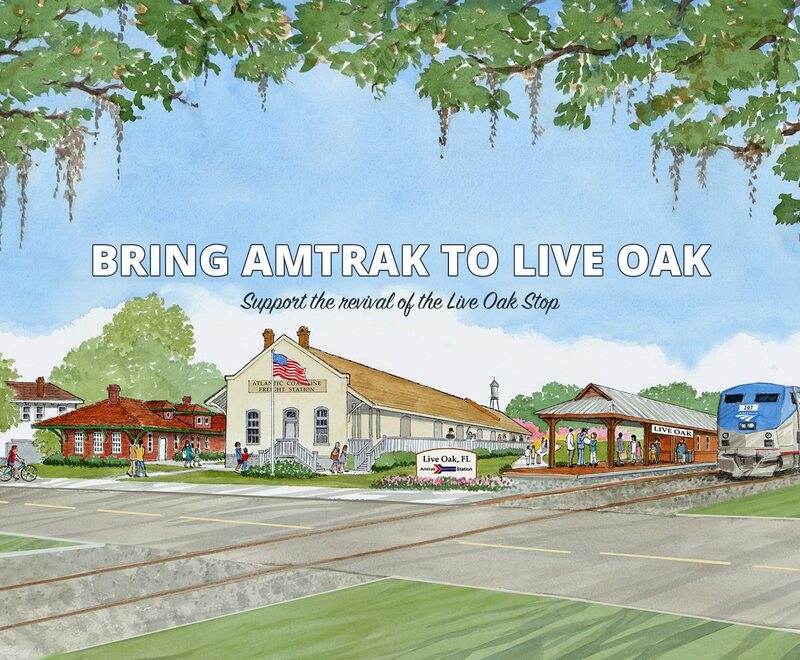 Then Live Oak can be another one of your Amtrak’s success stories. I am confident that many [tourists] would be happy to utilize Amtrak as a means of transportation to our area… The local transportation service, SVTA, is located 1.9 miles from the deport and will be available to provide transportation services for passengers from the train deport to a number of locations. The Suwannee River is one of eight magnificent waterways in North Central Florida. It proudly boasts to be the ‘diving capital of the world’… What a ‘Point of Destination’ for international and domestic visitors to the North Central Florida area. 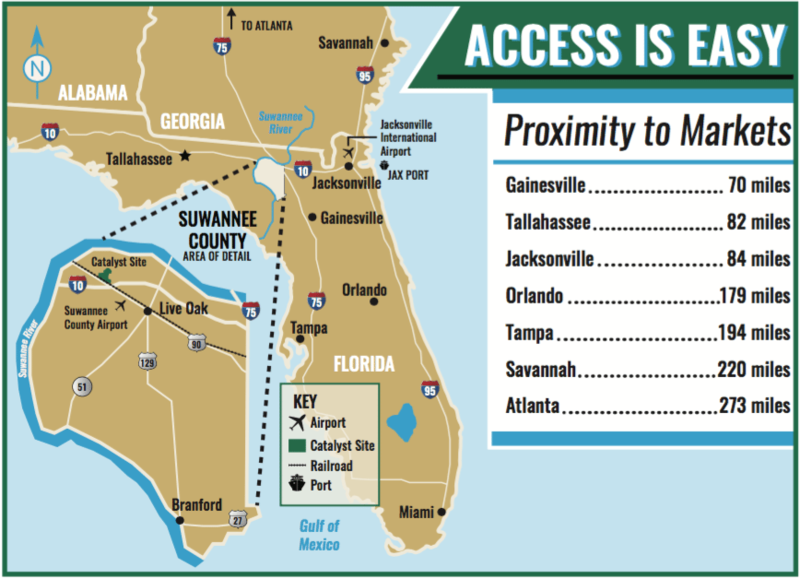 We [The Spirit of Suwannee Music Park] believe that our client base would welcome opportunities to travel by rail. We encourage your support to establish rail service in Live Oak, Fla.
We [the Suwannee County Economic Development Office] most definitely support the partnership between Amtrak and the Southern Rail Commission (SRC) to run a daily service train from New Orleans to Orlando, and then a supplemental service from Mobile, Ala., to New Orleans.